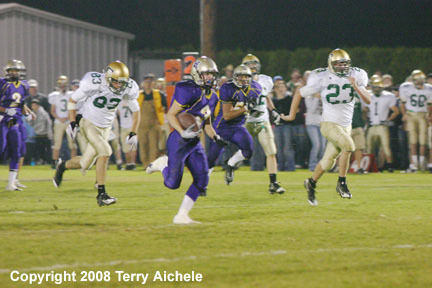 It's off to the races as Hermiston's Tyler Green ran for a touchdown in the second quarter. 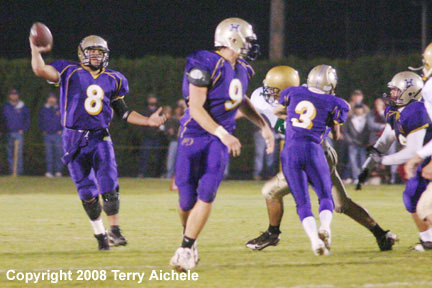 HERMISTON - The Hermiston Bulldogs hosted the Pendleton Bucks in the final regular season game for the two long-time Umatilla County rivals. Hermiston controlled the game from the beginning winning by the score of 41-20. Pendleton took the kickoff and was able to move the ball and pick up a first down. 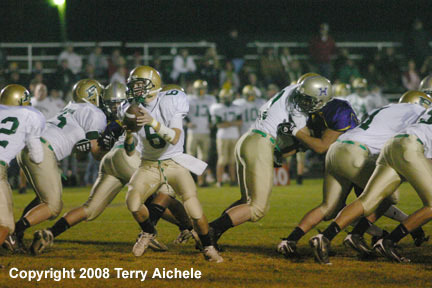 On their fifth play while on their own 31 yard line Buck quarterback Jake Talbot fumbled the ball to the Dawgs. The Bulldogs didn't miss the opportunity handed to them. Hermiston moved the ball down to the Buck 10 yard line. Sitting on third and six when Faafiaula Ena connected with Luis Ortiz for a touchdown. Ortiz hit the extra point giving the Dawgs a 7-0 lead at 8:21. 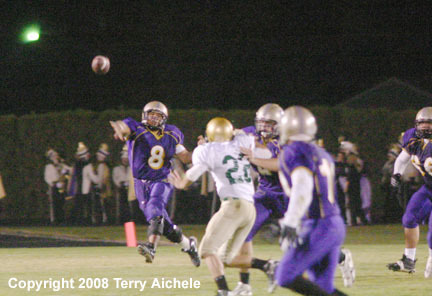 The teams exchanged possessions when at the 5:38 mark of the first Hermiston's Ena, on a quarterback keeper, had the ball punched loose and recovered by a Buck. The Bucks took ten plays to get to second and goal on the Hermiston four yard line. A Buck bulldozed into the endzone for a touchdown. The extra point was good and the teams were tied 7-7. There was another exchange of possessions until Hermiston let a Pendleton punt fly into the endzone for a touchback at 9:11 of the second quarter. Hermiston started on their own twenty yard line. On the fourth play from their own 35 yard line Ena handed off to Tyler Green who took off up the middle on a 65 yard touchdown run. Ortiz hit another point after to give Hermiston the 14-7 lead. Pendleton's next scoring opportunity began at 2:58 of the second when Tyler Green of Hermiston drops punt and the Bucks recovered on the Dawgs 15 yard line. Jared Standley of Pendleton took the ball down to the one yard line. The Bucks pushed into the endzone on the next play but they miss on the roll out of a fake extra point. Hermiston stays ahead 14-13 with about a minute to go. Hermiston took the ensuing kickoff and thirteen plays later Ena went into the endzone on a six yard quarterback keeper. Ortiz hit another extra point to give the Dawgs the 21-13 lead going into halftime. Hermiston took the opening kickoff in the third quarter. Using mostly a ground running game the Dawgs made their down the field in nine plays. Sitting third and goal on the one yard line Ena kept the ball and went up the middle on a keeper for the touchdown. Hermiston was offside on the first extra point attempt. That pushed Hermiston back to the eight yard line for the PAT. Ortiz missed the extra point - a rare occurance this year at home. Hermiston lead the Bucks 27-13 with 8:37 to go in the third. Hermiston next scoring opportunity came at 5:16 when Pendleton was forced to punt. Hermiston took the ball of the Buck 48 yard line. Six plays later the Dawgs were second and 25 on the Buck 37 yard line. Ena handed off to Green who ran it in for a touchdown. Once again Hermiston was caught offside on the extra point attempt. This time Ortiz nailed the extra point to give Hermiston the 34-13 lead with 3:06 to go. Hermiston took a punt on the 43 yard line. This time Ena openned up the passing game with several pass attempts and a connection with Cody Humphrey. A holding penalty on Hermiston had them second and 25 on the Bucks 27 yardline. Then a pass interference by the Bucks had Hermiston third and ten when Ena connects with Dorian Williams for a touchdown. Ortiz hit the point after giving Hermiston a 41-13 lead with about 30 second to go in the third quarter. Travis Jones of Pendleton took the kickoff and zig zags out to about the 30 yard line. Hermiston picked up two unsportsmanlike conduct penalties. The moved the Bucks to the Hermiston 40 yard line. Jake Talbot of Pendleton ran a quarterback keeper to the Hermiston 16 yard line. 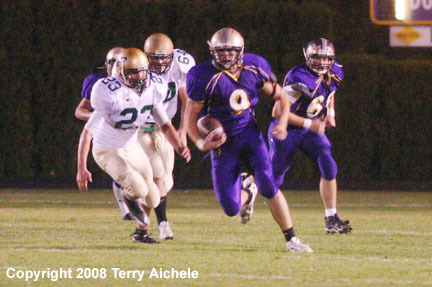 Following the start of the fourth quarter, three plays later Jared Standley made a one yard touchdown run. The extra point was good. That was the last score by either team with Hermiston ahead 41-20. The rest of the fourth quarter was both teams exchanging possession of the ball and no one coming close to scoring. Hermiston and Mountain View both ended up with 5-1 conference records. Both teams will play on November 14. Hermiston will host Corvallis. Bend Lava Bears have a 4-2 conference record. They will host Glencoe on November 7. Pendleton Bucks have a 3-3 conference record. They will travel to the Mid Western Conference third place team on November 7. Pendleton player Levin Fox takes the opening kick off. LEFT - Pendleton quarterback Jake Talbot turns to handoff the ball early in the first quarter. 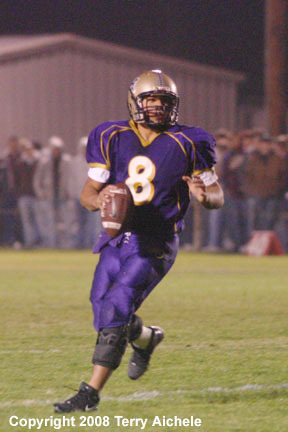 RIGHT - Hermiston quarterback Faafiaula Ena on a run early in the first quarter. 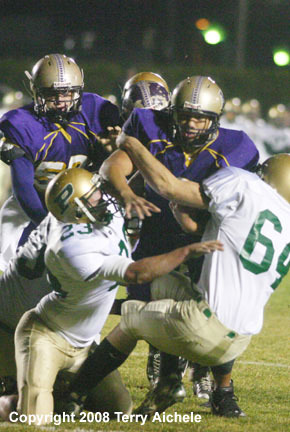 LEFT - Pendleton defenders swarm Hermiston quarterback Faafiaula Ena. RIGHT - Hermiston's Cody Humphrey on the run after catching a pass from Faafiaula Ena. 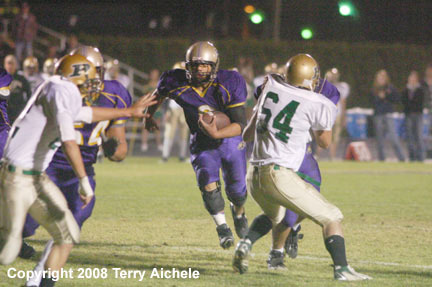 Hermiston quarterback Faafiaula Ena coughs up the ball while being team tackled by Buck defenders. A Pendleton defender comes up with the ball after Faafiaula Ena fumbles it. 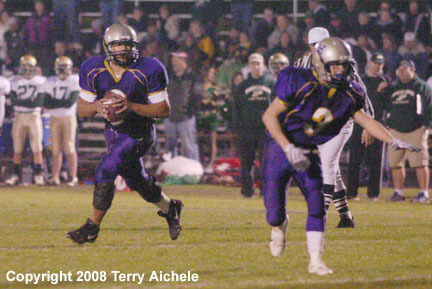 LEFT - Hermiston quarterback Faafiaula Ena drops back to pass. 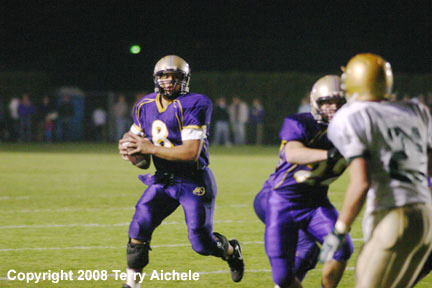 RIGHT - Hermiston quarterback Faafiaula Ena throws a pass. In front of him is tight end Cody Humphrey. LEFT - Luis Ortiz of Hermiston runs with the ball after making a catch. 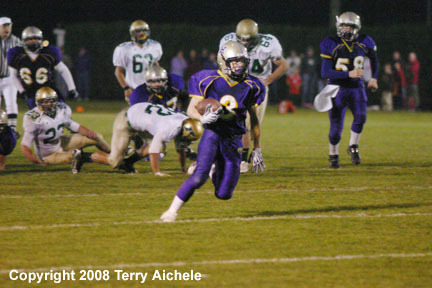 RIGHT - Hermiston's Tyler Green runs for a touchdown. 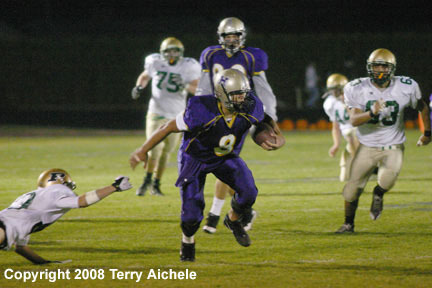 Hermiston quarterback Faafiaula Ena running on a quarterback keeper. LEFT - Faafiaula Ena of Hermiston on quarterback keeper. RIGHT - Faafiaula Ena throwing a pass. LEFT - Faafiaula Ena rolls out on a pass play. 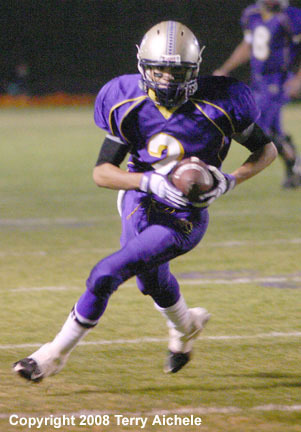 RIGHT - Hermiston's Tyler Gree running with the ball. 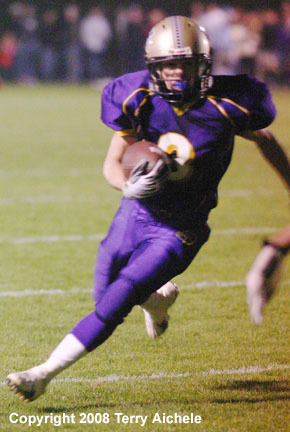 LEFT - Tyler Green of Hermiston running with the ball. 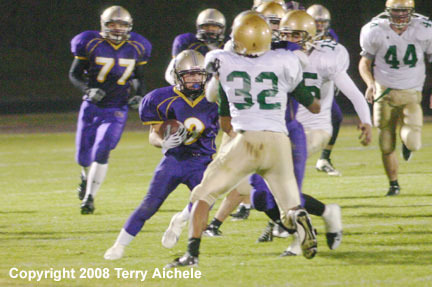 RIGHT - Tyler Green of Hermiston running along the sideline. Faafiaula Ena sets up to pass. LEFT and RIGHT - Faafiaula Ena rolls out to throw a pass. 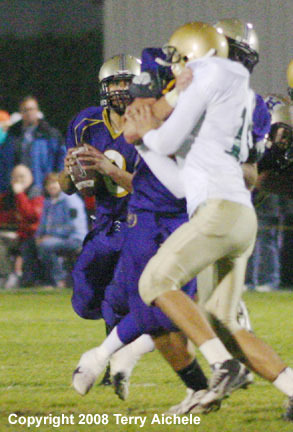 Hermiston's Luis Ortiz breaks up a pass to Matt Baty of Pendleton late in the game.